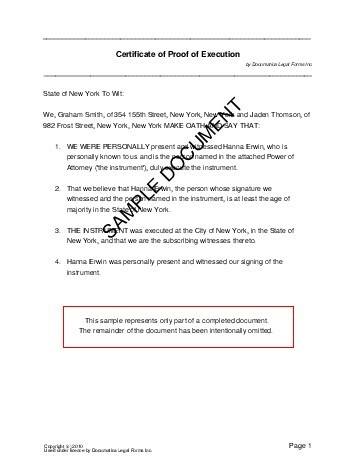 An Affidavit of Execution is used by witnesses to the signing of a document to confirm that they were present at the signing of the document and believe the signor to be of the age of majority. The affidavit of execution must be signed before a notary public or commissioner of oaths and is essentially a longer and more thorough version of the usual witness declarations on legal documents. How many witnesses are there? Do you wish to state the type of contract? We strongly recommend obtaining an attorney reviewed Affidavit of Execution directly from us. Below are some random samples we have created with Documatica. Please note that these documents reflect a certain set of answers, and it is very likely that the document you require is different. 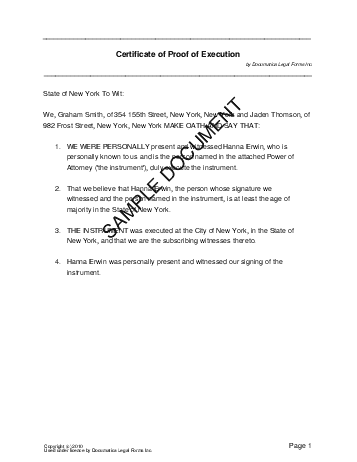 Do not rely on the templates below - create your own customized Affidavit of Execution with our webpage. For maximum legal protection, obtain a lawyer reviewed Affidavit of Execution directly from us.